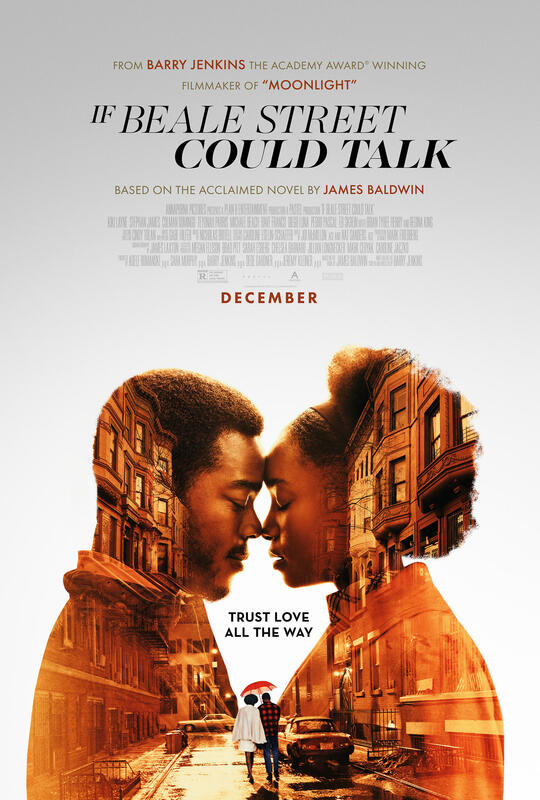 If Beale Street Could Talk is a moving and vivid love story of 2 young people in 1960s Harlem whose love becomes strained when the man (Stephan James, Race, 2016) is arrested and jailed for a crime he didn't commit, while the woman (gorgeous newcomer Kiki Layne) tries to work with a lawyer to prove her partner's innocence. With rich colors and snug close-ups, this film tells an impassioned yet restrained story of love fighting against social injustice. If Beale Street Could Talk is adapted from a 1974 novel by James Baldwin who was a leading literary figure in the civil rights movement of the 1960s and 70s, so the film presents many parallels between the race relations of the 1960s and today. Directed by Oscar-winner Barry Jenkins (Moonlight, 2016), his latest film takes a patient, intimate look at the inward emotional effects of police oppression and general discrimination. Another overarching theme is the importance of Black American families and the love nurtured within them (shown most notably by Regina King, Seven Seconds, 2018). The performances are beautifully measured, the narration captivating and lyrical, the dialogue layered with feeling. It's difficult to ignore this film as one of the best from 2018 because it has such a distinct style and genuine heart. Perhaps most importantly, If Beale Street Could Talk helps viewers understand what the Black American experience feels like; sometimes you have to live the life you're given.